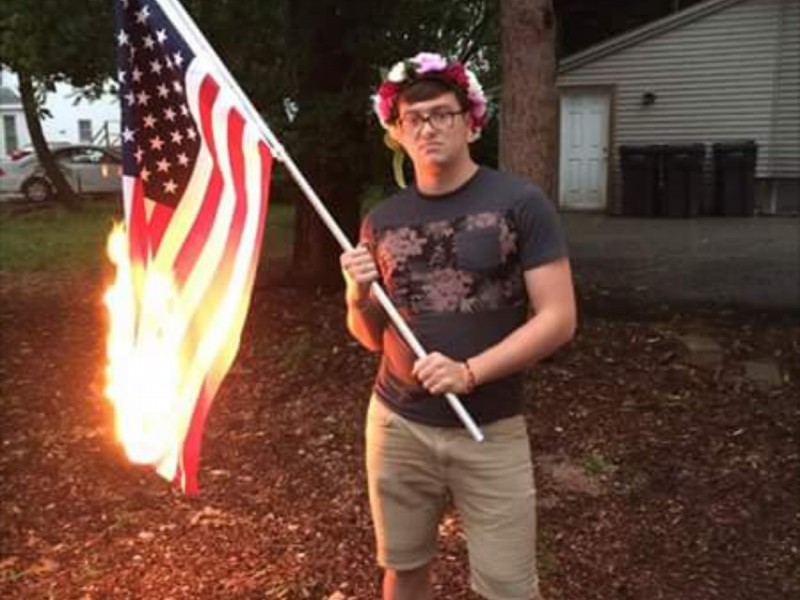 Last year, on July 4, 2016, Bryton Mellot was arrested by Urbana police for burning a US flag and posting the photos on Facebook. The protest was in response to the mass shooting in June at the Pulse nightclub in Orlando, Florida. His post went viral, and the case eventually made it to NPR, ABC News, and CNN. The charges against him were dropped, and the ACLU filed a civil suit on Mellot’s behalf in federal court. In September, a settlement was reached awarding $15,000 to Mellott, with the Urbana police admitting no guilt. After the original incident, the Public i published a statement in solidarity with Mellott and his right to free speech. Here we are honored to publish the first public interview granted by Mellott after his settlement. Your original July post apparently hit a nerve among many people. Were you surprised that it went viral? Why do you think that happened? I was actually pretty surprised that it had gone viral, I didn’t expect it to have an impact reaching further than the community I had built around myself in Chambana. But at that point I was still friends with many of the people I had attended high school with, so I would guess that this is how it ended up being spread so far. While there wasn’t really an “intended audience” for my post, it was understandably more upsetting to the people following me who had never left the mildly racist comfort of Mendota, Illinois. How has Trump’s election made a difference? 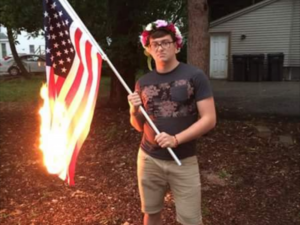 Have you seen over the last year that patriotism/nationalism/white supremacy/homophobia have gotten measurably worse? I think that Trump’s election has caused an increase in events of intolerance towards marginalized communities, but I don’t think this is because people are any more bigoted than they always have been. Trump gave them permission to bring their intolerance out of the closet and onto the streets, and I think it’s crucial that we crush this intolerance while we can all see it (or at least beat it back into the closet where its impact is minimized). Why did you settle the lawsuit and not take it any further? Do you feel like the $15,000 was fair? Do you think this will cause the Urbana police to think twice next time? Throughout the process of filing a lawsuit, I was operating under the advice of the ACLU. It was my understanding that taking the lawsuit any further wouldn’t guarantee any sort of ruling in my favor or consequence for the Urbana Police Department. At that point, it became a matter of bringing an immediate monetary penalty to the police department responsible for my arrest. To be completely honest, I have no idea whether or not the $15,000 was fair. I think very often in cases of police brutality/rights violations, the victim is already in a position of poverty and an ideological victory isn’t the most pressing concern for them. You can’t survive by eating “justice,” and the sentencing of a corrupt individual will never pay your bills. I think police departments use this to their advantage because they can provide immediate financial relief to the victim or their families by putting them in a position where they’re made to feel okay with surrendering their personal beliefs, letting the department off the hook. I think if we really want any police department to think twice next time they want to subjugate an individual, we need to focus on defunding them and creating a situation in which monetary awards are handed to the victim in conjunction with sentencing that matches the crime the officer has committed.